With 75% of businesses planning to increase social media spend this year, there is no doubt that more and more companies understand the need to capitalize on what has become an increasingly critical part of online marketing – becoming a social business. This means that it’s not just about one area of your company being prominent on social networks, but about ensuring that every employee is educated in social practices (communication, transparency, being responsive), and these are practiced both internally and externally. Here’s what that means for your company and a few ways you can go about implementing best practices. Open up the channels of communication and educate employees in the part they can play to help you become a social business. For example, who at your company is responsible for Facebook? Is it marketing? Sales? PR? Customer service? In truth, they all have a role. Lines of communication internally need to be open and effective in order to collaborate successfully. Such a program means that all employees are educated to go out and use social media to represent the company. That could mean contributing to a blog, getting involved in Twitter or using experience from their own role to improve the overall strategy. Ensuring that everyone at your company truly understands what social media is about, the benefits it can provide and the risks it entails results in more valuable, collaborative and reliable social media efforts. Educate, communicate and collaborate internally. Consider how each department can be a part of your online presence, and the effect they can have by interacting and engaging with consumers. Also, think about how you could use social media internally to communicate, train, educate, facilitate and share information among your team. Companies are in the public eye on a daily basis, and conversation will happen about their product, with or without them. So the question really, is how can you use tailor this conversation to your advantage? Social channels are all about discussion, which provide the perfect environment to get feedback and listen. Use social monitoring tools such as Twitter Advanced Search, Social Bro and Radian6, to find out what people are saying, how they feel, and consider how you can shape their attitudes towards your brand through your reactions. JELL-O pudding exemplified this back in 2011, when they ran a campaign which cheered up unhappy Twitter users by giving away free pudding. They monitored Twitter for happy and sad emoticons, using the JELL-O Pudding Face Mood Meter to gage the mood of the country. 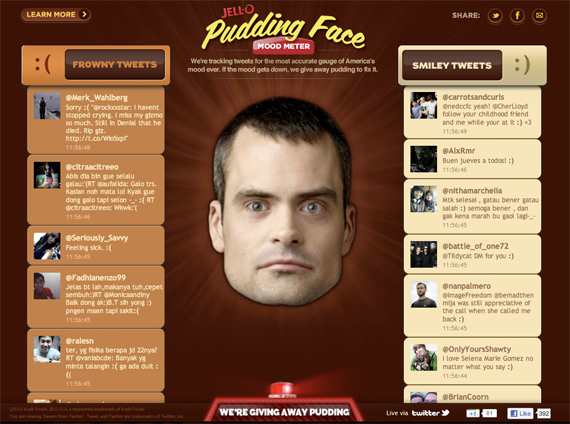 When the mood dipped, they started to offer free pudding to users who had included a sad emoticon in their tweet, to bring the collective mood back up again. JELL-O listened to the public and responded appropriately, turning something bad (a sad emoticon), into something positive (a happy emoticon). The popularity and publicity they received from this campaign was incredible, and one of the most successful social campaigns to-date, as measured by brand interaction and social mentions. This huge benefit to them came from one simple process - listening, socializing, providing value and driving engagement. 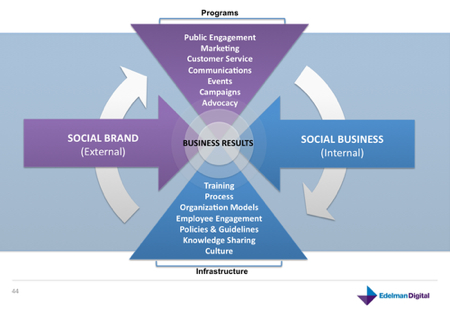 Becoming a social business is not an easy transition, particularly for organizations that have become comfortable in their traditional roots. Nonetheless, it’s an important step to take and will drive considerable benefit in the long run as online becomes a more and more important part of all of our day-to-day activities as individuals and as businesses. Praetorian Group has always aimed to lead the way when it comes to new ways to reach the public safety audience online, so we’re excited to introduce pre-roll video ads to our inventory and thought we’d share our experience and the parameters we’ve developed. Pre-roll video ads are one of the strongest online ad formats available. A 2008 study by the Interactive Advertising Bureau found that pre-roll ad placements perform particularly well for unaided brand awareness, online ad awareness and tagline association. In our initial tests, we’ve seen much stronger clickthrough rates (CTRs) than static banner image placements. For example, our most basic banners average .2 to .5 percent click through rates, whereas our preroll video ads have been 1.60 to 2.63 percent – in other words they can be literally more than 10 times as effective in terms of CTRs. When it comes to length, we strongly recommend 15-second units, which were found in the study to be the optimal length for brand association, ease of understanding and most efficient with the highest level of engagement. Clickthrough URL: Provide the URL which users will be redirected to upon clicking on the video screen. In addition, we recommend advertisers consider using a call to action in their video to direct users to click on the video screen as not all users may be aware of this functionality. With studies singing praises of online video boosting purchase intent, recall levels and effectiveness over banner ads, it’s easy to see why advertisers in the online space are moving more of their budgets into video advertising. You may be wondering how 9/11 affected the Praetorian Group as a company. When I think about 9/11, I can’t help but consider the formative impact that day had on our mission and future as a company. At the time, we had 5 employees and were struggling to find our way and make ends meet. Praetorian’s future was uncertain. But overnight, 9/11 changed everything. All of a sudden, the 70,000 law enforcement members on PoliceOne.com at the time as well as departments across the country had an urgent need to stay informed. They turned to the Internet and to us. I’ll never forget the day shortly after 9/11 when one of our members who was a chief of a small department called to ask for help. The only way he found out that his department was on alert was when he arrived home and his wife told him (she had seen it on CNN). Correspondingly, we created site sections and newsletters as well as an email and text messaging alert service to disseminate information. 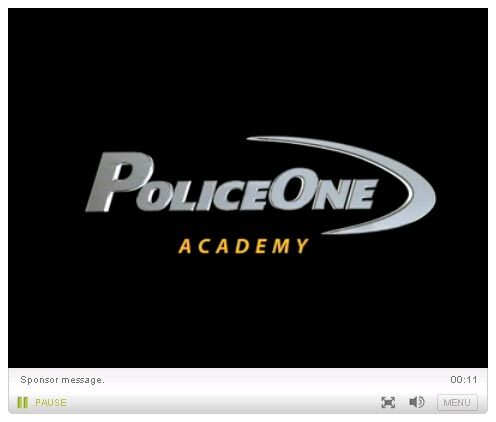 PoliceOne became a ‘must have’ tool to help spread the news of terrorism threats and educate law enforcement on tactics and best practices to prevent terrorism. Our membership grew by 100% in less than 12 months. At the same time, 9/11 energized our company and fueled our resolve to keep pushing forward in a time of significant uncertainty. It crystalized our role in the community and brought us closer to the first responders we serve, strengthening our mission and commitment. Ten years later, that energy and commitment is still strong and continues to ignite our mission. We count 700,000 first responders as members and a significant portion of our nations’ public safety community relies on us daily to provide them the information they need to stay informed. As I consider 9/11 and the state of Praetorian, I’m confident that we’re not only helping first responders everywhere better prepare for 9/11 related threats, but as importantly address the tragedy, challenges and threats they face on a day to day basis. As part of a company dedicated to first responders, 9/11 has significant meaning for our members, our customers and each of our employees. Let us take a moment to reflect upon the tragedy of 9/11 and the examples of heroism and sacrifice we saw that day and how the first responders we serve – whether they be police officers, firefighters or paramedics – make sacrifices and risk their lives every day to keep us all safe.